Only one device is used to control the functioning of both android and Ubuntu. In the android version, an Ubuntu Installer app is used to install Ubuntu. At present, the Ubuntu updates can be done only from the android version and not the Ubuntu version. The ADB tools shall be running on your personal computer and a free storage of around 2.7 GB is required in the device in which it is going to be installed. Also you need to enable the USB debugging. This shall create backup.ab with all of your data. Later, after android rooting or unlocking you will be able to use $ adb restore backup.ab to restore all of your data. Remember these step is to unlock your device. Follow only if your device is locked. You need not do these things if your device is already unlocked. These steps will delete all your phone data. The device will now boot itself into the boot loader. Now after doing this much. Boot your device. Now follow these steps carefully for Initial Device Setup. Any mistake done here can create problems. Boot your device to android. In Ice Cream Sandwich (version 4.0) go to Settings and turn on USB Debugging (Settings – System – Developer options – USB debugging). In Jelly Bean (versions 4.1 and 4.2) you go to Settings, About Phone and tap the Build number 7 times to view the options of the developer. On Android version you must then enable USB debugging via Settings – Developer options – USB debugging. You will also need to accept a host key on the device. A pop up key will show the host key based on the android version which it is installed. ‘adb devices’ should not show the device as ‘offline’. If it shows offline then unplug your device and then run adb under sudo on the workstation (sudo adb kill-server; sudo adb start-server), then again connect the device. In some cases, the device will show offline, and the host key will not appear. This will happen if the USB connection method is ‘MTP’ (default). Uncheck all options in the USB connection method (Settings – Storage – Menu – USB computer connection – MTP, PTP). This will surely solve the issue. Now save this version on your device and if you want the version you can find it in by going to Settings – About Phone – Build Number. 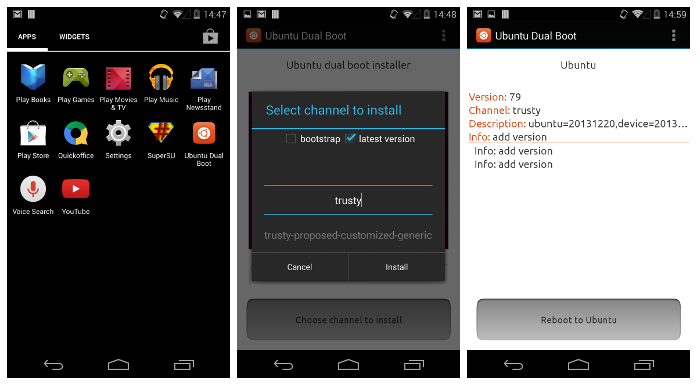 Now follow these simple process to install the Ubuntu Installer app in Android smartphone. By typing this command, it will make the installation script executable. After installation is completed then the phone will reboot itself for several times. After this is completed it will boot to Android and you will find the dual boot app as “Ubuntu Installer” in the Apps section. Here are few things you need to know about all these steps and process. The phablet flash tool and the Ubuntu installer support common channels. When you select the Ubuntu channel you need to uncheck the latest version option or it will default to the latest image. If the installation of the Ubuntu download is completed while the phone is locked the installation button will show resume install and you have to resume it to complete the process. The bootstrap checkbox that appears when you select the Ubuntu channel helps you to clear the user data. Here is one more very important stuff. To download the newer version of the Ubuntu you need to delete your older version of the Ubuntu as dual boot is a different method of update. If you click the delete user data button while uninstalling the older Ubuntu version then all your contacts, installed applications, photos, etc will be deleted. After uninstalling the older Ubuntu version you can follow the same steps for installing the newer version of Ubuntu.